Fat Bruce Lee and I were visiting San Francisco for a conference, and we scheduled a lunch meeting at LarkCreekSteak. 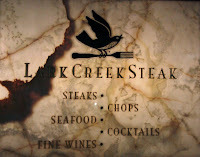 I had seen a particularly stunning review on the SeriousEats site, and I wanted to see if LarkCreekSteak was in the business of delivering consistent excellence. I quickly discovered that there was a fair amount of inaccuracy in the review, which I had read. As a result, the LarkCreekSteak burger failed to live up to the hype. Don't believe everything you read...unless you read it here. We ordered up a couple of the Steakburgers at $13.95 each ($15.45 with a slice of cheese), and the burgers came with some hand-cut fries. We waited about 20 minutes for our cheeseburgers to arrive. I did send my top bun back, since the brioche was very nearly hollow. The Beef: The burger beef was a combination of freshly ground, wet-aged cuts of both Filet Mignon and NY Strip. Wet-aged beef in a 15 dollar burger at a steak house? Sigh. The burger patty weighed in at 8 ounces. The beef was very loosely packed and ground at a setting in the medium range. This resulted in an overly loose mouth feel. The burger beef offered up no resistance. In fact, the unmelted cheese was more toothsome than the loose (nearly mealy) beef. The flavor of the beef was beefy, but it offered no trace of that characteristic steak house funk. There were tame notes of minerality, which belied the premium cuts. The beef was moderately juicy, and the fat content was in the 20% range. The beef tasted fine, but it was well below what one would expect of a steak house. I did not seek out the source of the beef...it was not sufficiently interesting to warrant further investigation. The Seasoning: The beef blend was unseasoned. 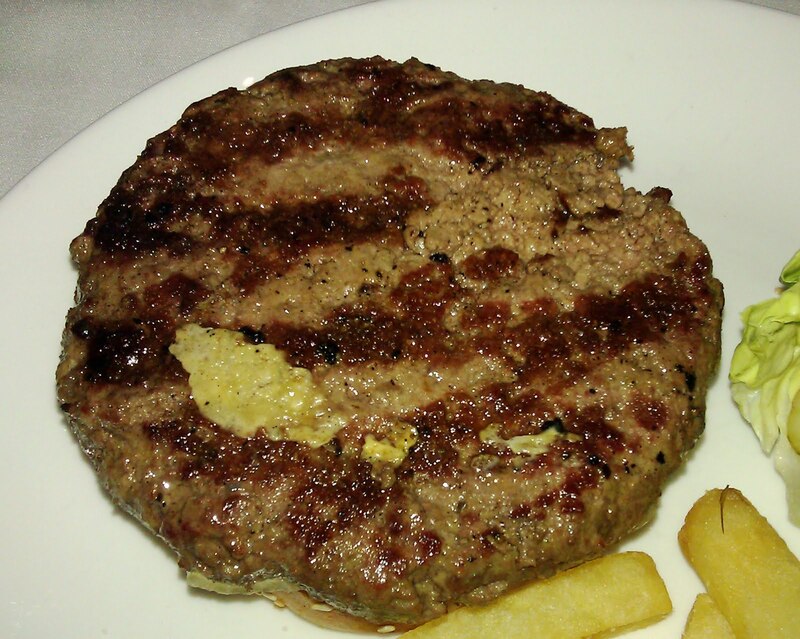 The burger patties were liberally seasoned with freshly ground salt just prior to being placed on the wood grill. The seasoning was appropriate, but certainly not interesting. I had hoped for a proprietary steak house blend of seasonings. The Sear: The sear on our burgers was nominal. The wide grates of the grill applied a moderate, partial sear, but that sear was so thin that it was barely discernible to the palate. Sadly, the review, which I had read, really zeroed in on a magnificent sear. That sear was simply not present when we visited. The Preparation: The burger patties at LarkCreekSteak were formed from freshly ground beef during morning prep. The looseness of the patties indicated that these were truly freshly formed. Unfortunately, not enough pressure was applied during that process to create a sufficiently firm bite. The lack of sear, and the fact that the patties were turned three times on the grill, suggested that there was little burger cooking talent present in the kitchen on the day of our visit. What was really disappointing was that the almond wood-fired grill imparted absolutely no flavor of char or smoke to the dish. The grate on the grill was positioned too high above the coals. To the credit of the kitchen, the request for Med-Rare was honored. The Cheese: We went with the Aged Gruyere, and this was a disappointing cheese. It was not smooth, creamy, nutty, or buttery. The unmelted Gruyere was simply a little salty. It ended up being on the leathery side, and it sweated a fair amount of oil. I was astonished that a steak house didn't finish the dish under a broiler to ensure that the cheese would be properly melted. The Bun: The bun at LarkCreekSteak was solid. It was a seeded, brioche-style bun from PANoRAMA in Marin, CA. The bun was only barely sweet. It was yeasty, firm, and moist. 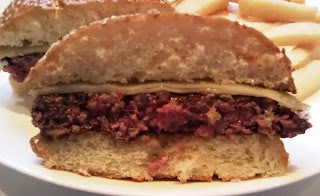 It was not sufficiently toasted to bring additional texture to the party, but it was competent at absorbing stray juices from the burger patty. The Fries: The thick, square cut steak fries were wonderful. They were par-cooked in canola oil and finished in the same. The fries were cut in house and cooked to a pale, but perfectly crisp, finish. The fries were hearty, creamy, and rich with fresh, earthy, potato flavors. The fries were the winner on the plate. The Toppings: Both the Bibb lettuce and the sliced tomato were fresh and delicious. The Value: Meh. 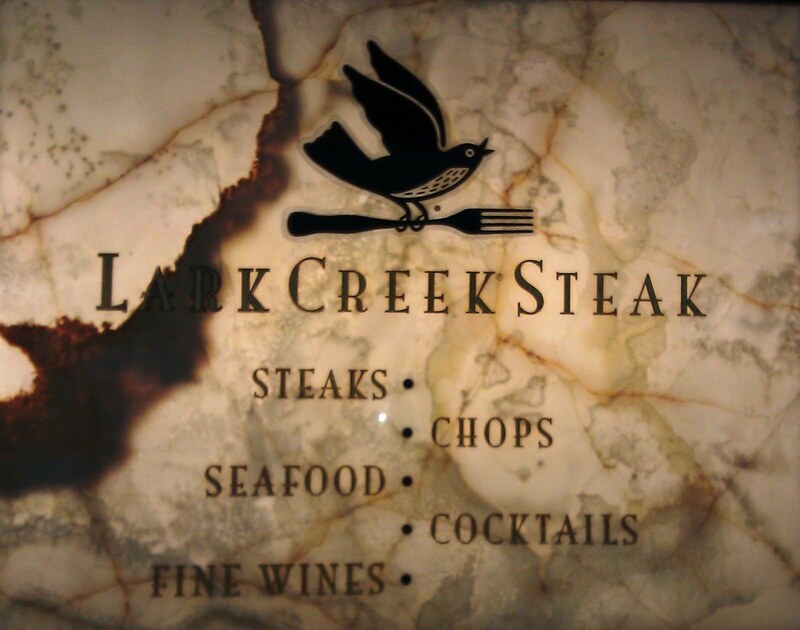 The value was on the weak side at LarkCreekSteak. The $1.50 upcharge for unmelted cheese on a 14 buck burger was insulting. The wet-aged beef checked most of the boxes in terms of flavor, but it lacked sufficient punch. 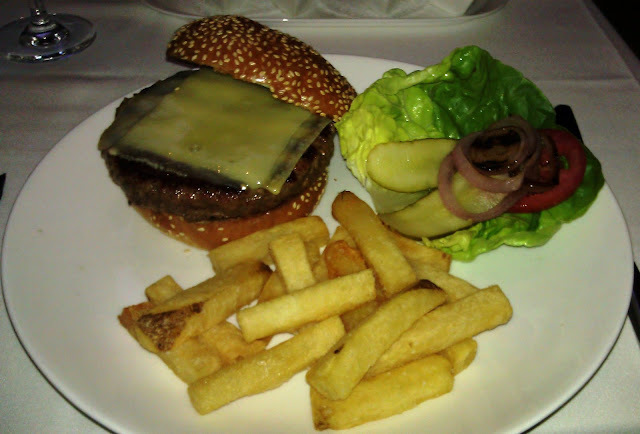 The preparation was weak, and as a result, the mildly seared, loosely packed burgers leaned towards dull. LarkCreekSteak had all of the elements in place to deliver a spectacular burger. LarkCreekSteak did not deliver a spectacular burger. Burger Review : LarkCreekSteak checked off the obligatory "burger box" on their menu with a slightly above average tasting burger, which was prepared in a lackluster fashion.